Liposuction is used to remove excess fat from different areas of the body in patients where diet and exercise do not suffice. It has helped countless people to improve their body image by slimming and reshaping problem areas. Liposuction is a fairly simple procedure when compared to other types of cosmetic surgery but I still like to approach it from a very personalized perspective. Every patient has different wants and needs and not everyone will be a suitable candidate for liposuction. This is why I always consult with my patients prior to any type of surgery so the best results can be achieved. The results of liposuction will be apparent immediately but the swelling and bruising that are common with the treatment means that final judgment should be reserved until a few months after the treatment. Provided the patient maintains a healthy lifestyle, the results of liposuction are long lasting. The patient presented is a 36 year old who has had children and gained a bit of weight afterwards. She was wanting to get her pre pregnancy body back. She also suffered from having large breasts. She was a 38I cup size and suffered from significant neck, back, and should pain. She underwent a traditional breast reduction with abdominoplasty (tummy tuck) and liposuction of her flanks and abdomen all in same operation. She was required to stay overnight for observation and was back at home the following morning. The post operative pictures are shown. Suitable candidates for liposuction are people who’ve tried to lose excess weight through diet and exercise but have been unable to remove excess fat from certain parts of their body. Other factors that make a person suitable for liposuction are being free of any medical conditions that might impede the healing process and having a healthy and realistic attitude towards the results that can be achieved. 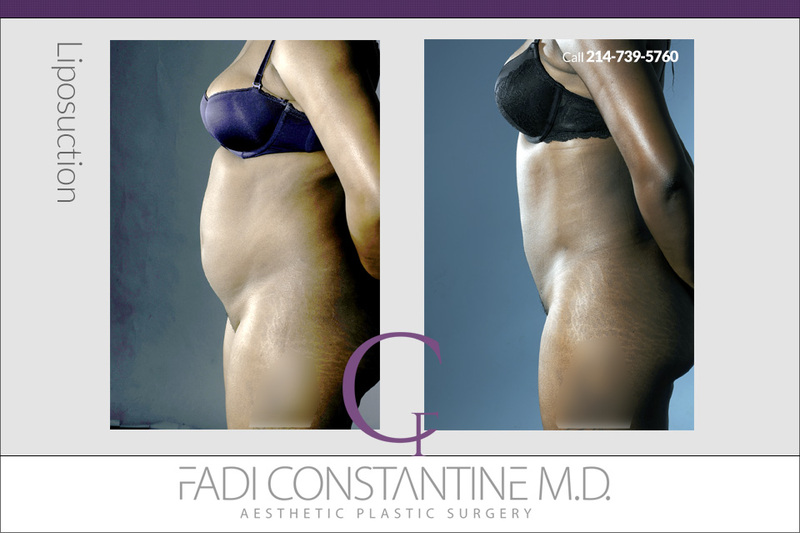 To book a consultation for liposuction with Dr Constantine, give us a call on (214) 739-5760. HOW LONG THIS PROCEDURE TAKES? WHAT IS SIDE EFFECTS OF THIS? WHEN CAN I SEE FINAL APPEARANCE? HOW MUCH TIME DURATION OF RESULTS LIES? programs in the country, Dr. Constantine loves to perform the most delicate and demanding plastic surgery procedures. Our team is known for natural results without an “operated” look.